The internationalization of companies and the resulting worldwide mobility of their shareholders/partners, as well as managing directors, have led to binational marriages or dual citizenships, which have rather become the rule than an exception. Therefore, the assets are often spread over a multitude of jurisdictions due to the extensive mobility of capital. However, as an attractive business location and with its high standard of living, Germany also attracts a large number of companies and wealthy people. This often results in German inheritance and gift tax consequences: on the one hand through residence or habitual abode, and on the other hand through domestic (German) assets. 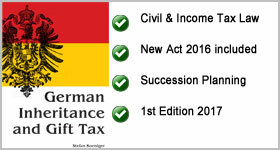 The compact commentary The German Inheritance and Gift Tax comprises all legal texts of the German Inheritance and Gift Tax Act, including a practical concise commentary. Furthermore, the relevant valuation regulations for the Inheritance and Gift Tax Act are presented, and important points of reference for the civil and income tax law are indicated. A variety of practical advice and instructions regarding tax planning complete this commentary. For reasons of clarity, the organization of the commentary is based on the Inheritance and Gift Tax Act: Regulations regarding tax liability are part of §§ 1–9 (part 1); the valuation is found iSusssn §§ 10–13d (part 2); before the calculation of the tax is presented in part 3 (§§ 14–19a). Tax assessment and collection (part 4) are included in §§ 20–35. The last part comprises authorization provisions and final provisions (§§ 36–39). The commentary already takes into account the recent changes to the Inheritance and Gift Tax Act of November 9, 2016, after the German Federal Constitutional Court declared much of the previous inheritance tax privileges for business assets as unconstitutional on December 17, 2014. From the perspective of the international succession practitioner, this commentary is indispensable to develop a broad understanding of the German Inheritance and Gift Tax Act. Furthermore, as a novelty in English literature, the commentary allows direct access to insider know-how written by a German expert in cross boarder succession planning. In addition, the author provides the latest developments in the fields of German succession planning on https://german-inheritance-tax.com including the decisions of the financial courts, publications of the ministry of finance as well as expert reports. Therefore, this book is indispensable for international tax lawyers who are involved in succession planning for clients who either reside in Germany or hold German assets.